During the cold months, furniture donations slow down considerably. Help us serve the needs of our local communities by sponsoring pieces of furniture to be built in our warehouse. Together, we can make a difference! 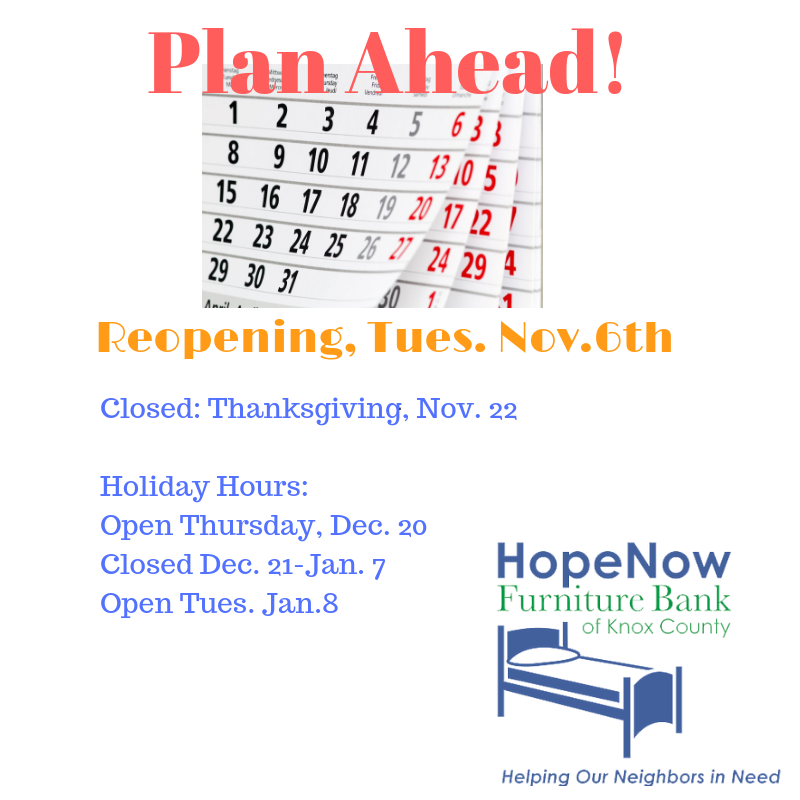 HopeNow Furniture Bank provides furniture and household goods to families needing help in Knox County. This is possible because of the compassion and generosity of our community. Over the last three years, HopeNow has provided furniture to 793 households, which included 2,222 individuals, 988 children and 418 people with disabilities. To sponsor a piece of furniture, visit our donation page or mail a check to P.O. Box #627, Mount Vernon, Ohio, 43050. KICKOFF! 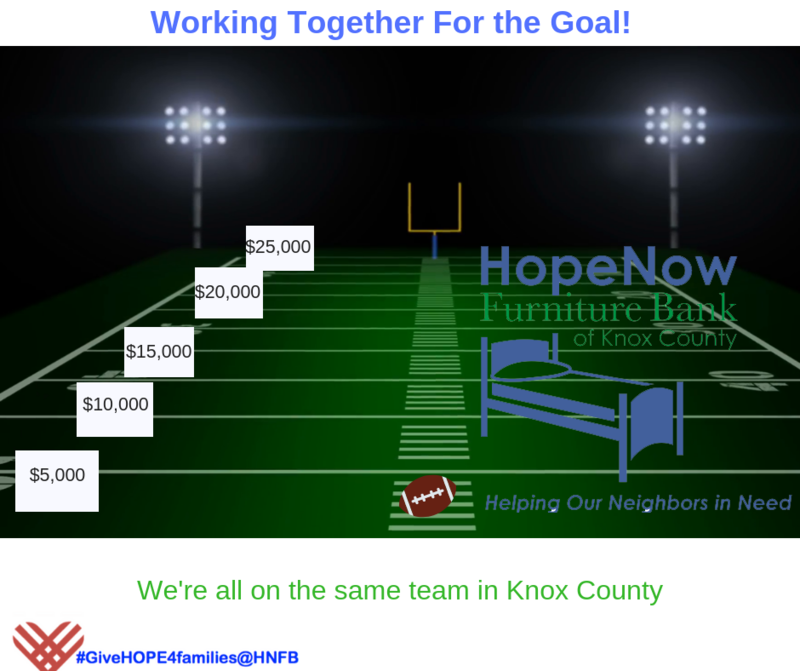 We are excited to begin the campaign to raise funds to enable HopeNow Furniture Bank to continue it’s work here in Knox County. We have a lofty goal, but funds have started to come in. Stay tuned to our Facebook page to see current totals. Some of our fabulous volunteers have decided to issue a challenge! • The warehouse will be closed on Thanksgiving Day, Nov. 22nd. • The last day of client appointments before the holiday closing is Thursday, Dec.20th. • The warehouse will be closed for the holidays from Dec. 21 – Jan. 7th and will reopen for regular hours on Tuesday, Jan. 8th. Now is the time to do an act of kindness while you do some of your holiday shopping! If you shop online at Amazon, here is a GREAT opportunity to benefit HopeNow Furniture Bank and thereby our neighbors in Knox County who need our help. Log in to smile.amazon.com/ch/26-4636287 to do your shopping. Amazon Smile will donate 5% of the total to HNFB. Shop now, because the offer is only until November 2. Shop today, and we’ll all be SMILING! The 2017 HopeNow Furniture Bank Community Impact Report is now available. In 2017, 215 families were served, including 337 adults and 278 children. Each household was provided with an average of 7.5 pieces of furniture and 2 large boxes/bags of household items. 54% of households included a disabled member, 5 of whom were veterans. 20% of households had a senior member over 65. The average monthly household income was $848. Furniture represented a volume equal to 17 semi-trailer truck loads. Also in 2017, HNFB received over $12,000 in contributions, the highest ever, as a result of our annual fundraising appeal letter. We also funded a new paid executive director position through grants from Ariel Foundation, the Community Foundation, the Burgett Family Foundation and the Arlene & Richard Landers Foundation, and we created two crew positions to pickup furniture donations, paid for by furniture pickup fees, and a new volunteer office manager position. We purchased two new laptops with funds from the Harcourt Parish grant, and we streamlined our website for easier editing and created an online form for donations via PayPal. In addition, HNFB purchased a newer box truck with lift gate with grant funds from the Community Foundation and installed a dust collection system in our wood-shop with grant funds from Ariel Foundation. We have also reorganized our warehouse for better efficiency in managing furniture inventory. Volunteers built dozens of bed platforms of various sizes and tables for clients when inventory was low, and they made hundreds of wooden toys from scraps to sell at community festivals to help cover wood-shop expenses. Churches and local agency-based organizations in Knox County referred 40 low-income families to HNFB for furniture assistance in 2017, totaling 20% of all families helped by HNFB. HNFB partnered with agency-based organizations including Behavior Health Partners, Interchurch Social Services of Knox Co., Children’s Services, Job & Family Services, New Directions Women’s Shelter, American Red Cross of Knox Co., Knox County Veterans Services, Area on Aging, Midwest Innovations, and local churches. The mission of HopeNow Furniture Bank was generously supported in 2017 by financial donations from numerous individuals, businesses, churches, and service organizations. This support was critical in maintaining our Services. Major financial contributors included: Ariel Corporation & Ariel Foundation; Arlene & Richard Landers Foundation; Community Foundation of Mount Vernon & Knox Coounty; Elks of Mount Vernon #140; Faith Lutheran Church; First Congregational United Church of Christ; Fraternal Order of Eagles #760; Gay Street United Methodist Church; Harcourt Parish Episcopal Church; Mulberry United Methodist Church; Soroptimists of Mount Vernon & Knox County. 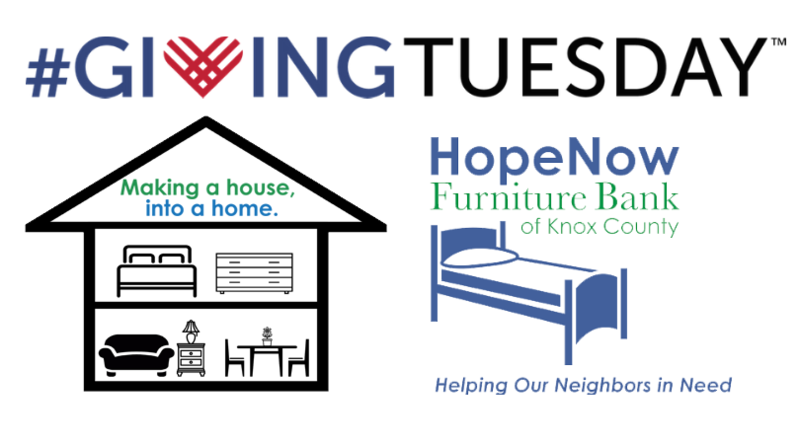 HopeNow Furniture Bank relies on in-kind donations to provide free furniture and household goods to Knox County families who cannot afford to furnish their homes. In 2017 we received donated furniture from 498 donors. We offer a pick-up service for those donors who cannot drop off their donations at our warehouse. Pickups are done on Saturdays for a nominal fee of $20. To schedule a furniture pickup, donors can complete a pickup request form online or call HNFB at (740) 358-2998 and leave a message. Furniture can be dropped off at our warehouse located at 1025 South Main Street in Mount Vernon during warehouse hours (Tuesday 1-3:30 and Thursday 10-12:30). Major in-kind contributors included: Brenneman Lumber Co. (provided lumber); Connell’s Home Furnishings; Johnny’s Mattress; Mindy’s Ohio Mattress; Mount Vernon Nazarene University; Templed Hills Campground. Volunteers are the heart and soul of HopeNow Furniture Bank. HNFB’s operation is run by a small group of approximately three dozen dedicated volunteers who provided more than 12,000 hours of service in 2017. Find out more about joining us in our mission. 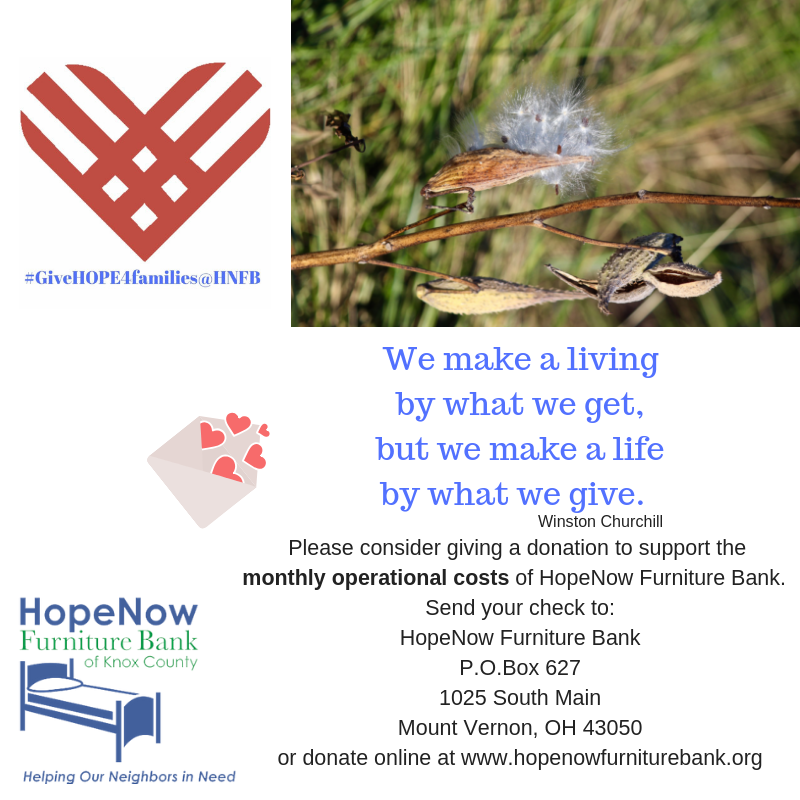 HopeNow Furniture Bank is now an ambassador for #GivingTuesday. 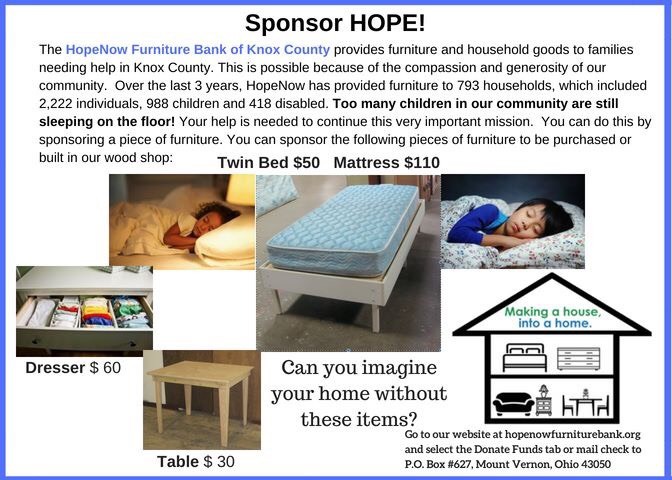 HopeNow Furniture Bank is a nonprofit organization seeking to provide, free of charge, basic furniture and household goods for individuals and families of Knox County struggling to furnish their own homes due to poverty and other challenging life experiences. Our vision is for all Knox County children and families to live in homes equipped with essential furnishings, thereby providing basic comfort, encouraging better family unity, and relieving unnecessary suffering. Since 2005, we have been continually serving the community of Knox County, in spite of ever increasing costs and dwindling numbers of volunteers. For the past year or so we have experienced a deficit in expenses, which caused us to be concerned about our ability to keep this mission going. However, with the awarding of grants for the salary of an executive officer, and the faithful donations from supporters, we look forward with hope. This year, as we come to the community to ask for your support in joining us to build this organization, we are partnering with the global Giving Tuesday movement to promote awareness and involvement in doing something for others. #Giving Tuesday is a global day of giving that harnesses the collective power of individuals, communities and organizations to encourage philanthropy and to celebrate generosity worldwide. Those who are interested in joining HopeNow Furniture Bank’s #GivingTuesday initiative can donate on this website or through our Facebook page as well as learn more about our related events. Checks can be sent to HopeNow Furniture Bank at P.O. Box 627, 1025 South Main Street, Mount Vernon, OH. To learn more about the #GivingTuesday movement, visit www.givingtuesday.org or their Facebook page or follow @GivingTues and the #GivingTuesday hashtag on Twitter.